Mr XXXX was woken in the night by the sound of a neighbor's dog whining, and a strange feeling. He ventured outside and saw a strange light in the sky. He describes the light as being in three parts, triangular with the brightest point of light in the front. Mr XXXX went back inside grabbed his video camera, and filmed for 4 minutes. 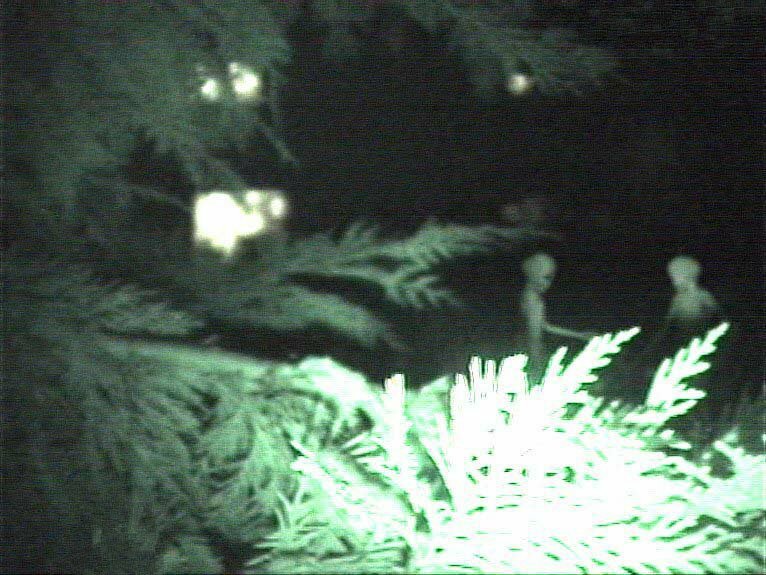 He describes hearing a muffled noise near the end of his garden and approached and filmed what he called "strange little ghost". Mr XXXX claimed to have had strange experiences throughout his life and an interest in the paranormal. Photos taken several years ago. Original photos and negative were obtained, and object sighted was determined to be in the photograph and not dust. I woke up around 4.30 am (2/21/03) and could not sleep. When I went into the kitchen to get a drink of water, I saw this glowing red-green, down real low hovering towards the foothills. When I went to get the camera it was gone, and then all of sudden it flashed right in my window, so fast. Do not look at the flash of my camera, look at what I circled (full picture below). It made me a believer, just what the thing did. WHEN IT GOT HIGHER IT WAS GLOWING AS YOU SEE! I live in Madera County, CA right above the foot hills. This was submitted from one of my site's visitors. They captured the photo a while ago, but had no one to show it to for a better opinion. 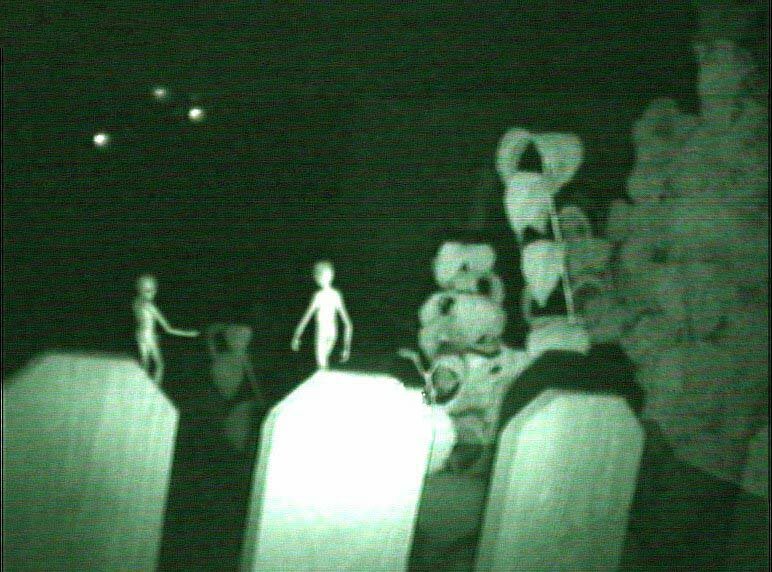 Dust can be seen either on the camera's lense or when the picture was scanned. However, the triangle on the left hand side is in the photo itself and is not anything conventional. "There was one photo that appeared flawed(?). I examined it closer, and the first question I asked myself is "what in the world is this?" The longer I have looked at this the more questions I have. I'm sending you an unaltered copy; I'm also including a zoomed photo of the object in the original photo. I have concluded that the object is real; the lighting and shadows suggest a real object. 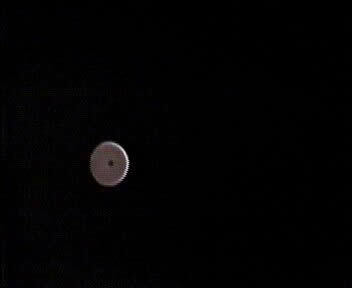 Also, it appears the light or space around the object is distorted like a gravity field, air compression? At any rate, when I was taking the photo the object was not noticed by me or my family." submitted by John Kappler from Corvallis, OR. He took this beautiful photo and captured a strange object. He did not see the object at time of picture. 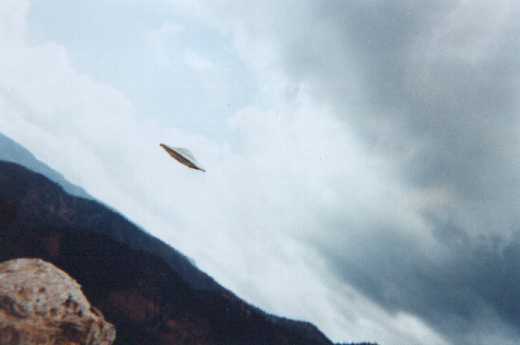 He noticed the strange object a year later while going thru the photos of his trip to Utah. Insert is a contrast enhanced close up showing a solid object, with the light source and angle correct. Blowing up the image, you can see a triangle of dots on the unlit left side. The photo was taken on June 6, 1966 (strange date). 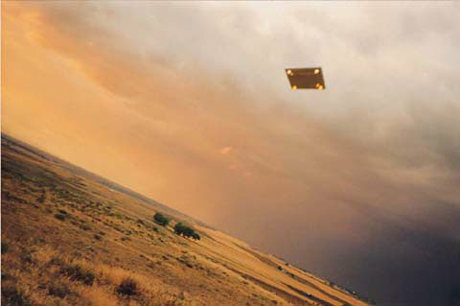 The object was photographed from an Air Force C-47 aircraft. The photo was taken at 12,000 feet. The location at the time of the exposure was 25 miles Southwest of Provo, Utah. The UFO was in sight for 10 seconds. The Air Force pilot could not keep up with the UFO. The film was EH135, 1/500 second at f22, 35mm. 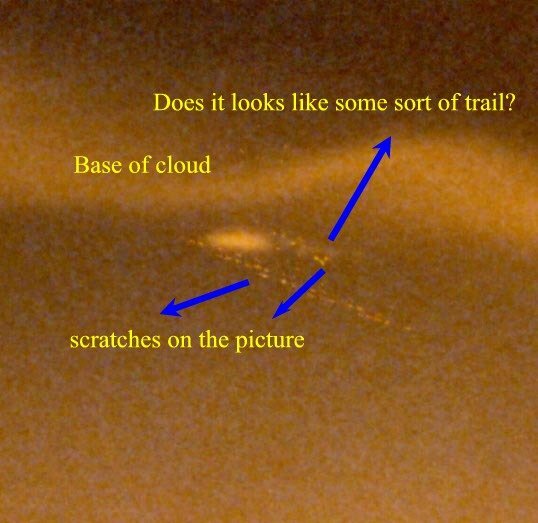 No other Info available on this beautifull shot of southern Utah, with a Disk -UFO clearly visable! No Info On This Photo. 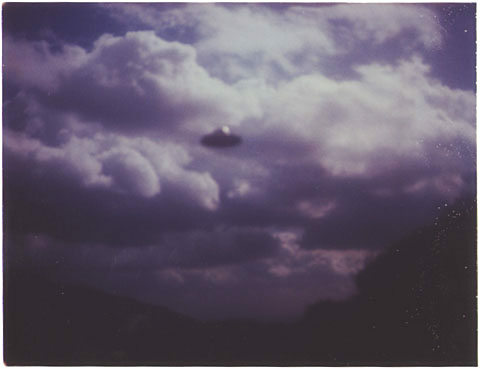 if you have any information about this Amazing and beautiful UFO photo please contact us. 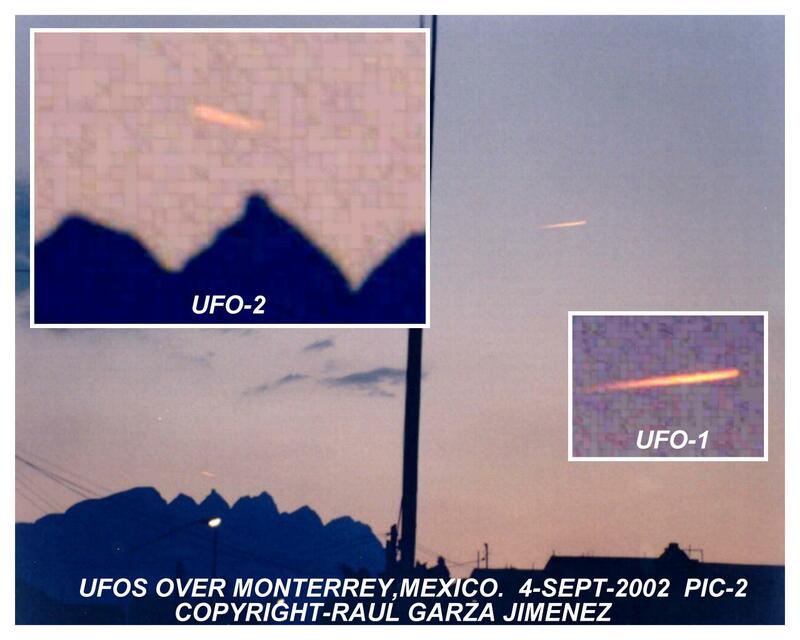 On September 4, 2002, Raul's brother Roberto noticed an anomaly in the sky above Monterrey and began to photograph the object, as depicted in these pictures. 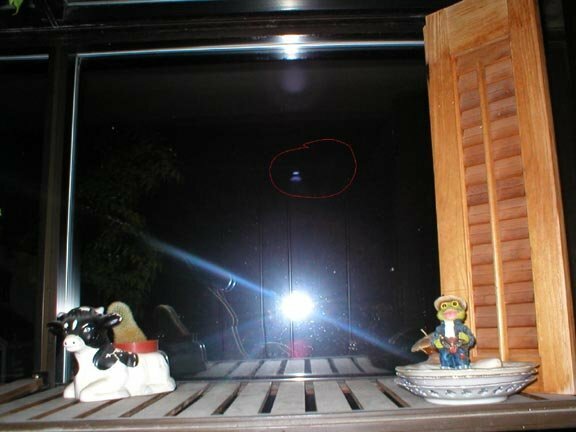 He saw two UFOs at once, as shown in the second photograph which was photographed from Roberto's home in the north-central part of the city. The more distant object (coded UFO-2) appears to be traveling over Las Mitras Mountain. 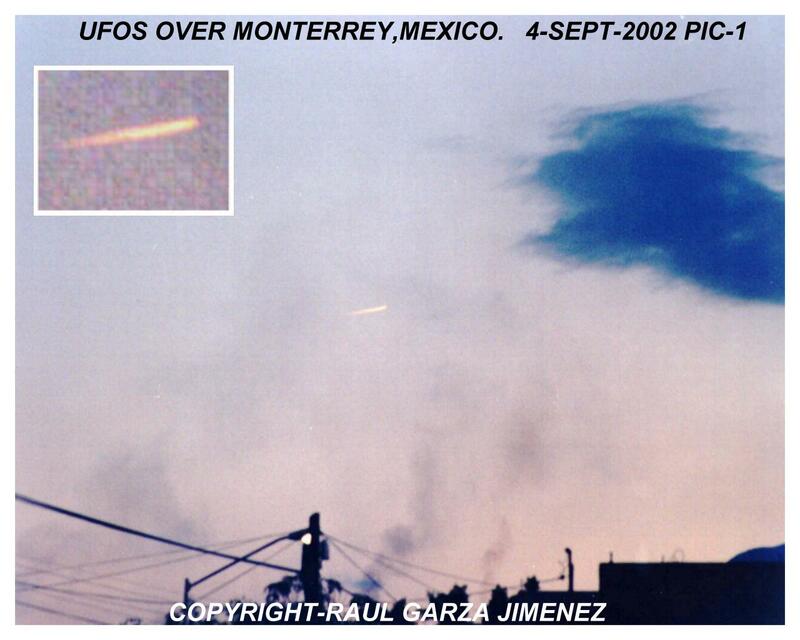 Shortly after the sighting, Raul also received a telephone call from Mr. Jeronimo Flores (a personal friend and fellow UFO researcher) who had also seen the same UFO activity over the city. 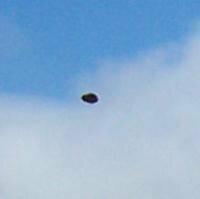 I was outside in my backyard taping the sky near the sun's corona and I picked up an object moving very fast across the sky. I did not see this object until I brought the tape inside and played it on my VCR (video still below). It seems to have a cigar shaped top to it and the bottom of this object seems to have three circular objects that are rotating. I know that they are rotating because this object appears in three frames and in each frame the circular objects on the bottom are in a different place. Has anyone else seen any objects that look like this one? This happened in August of 2002. This photo was taken by Dave Rosenfeld. In the Salt Lake City, UT. Rose Park area 1999. Using a 35mm Canon automatic. At first we thought it was camera shake, but we noticed that the streaks were going in different directions. There is the bright streak towards the top, and two colored dotted streaks towards the bottom. 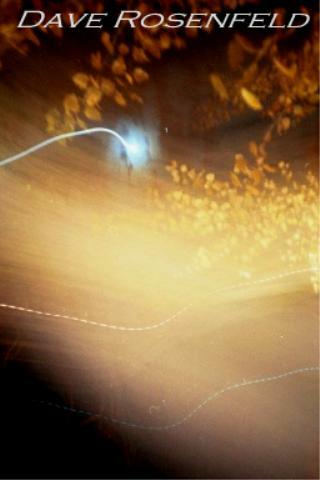 And some kind of energy or light source going through the photo. In the Canyon of dreams, an Area that is considered one of Utah's Hotspots, but isn't on any map. 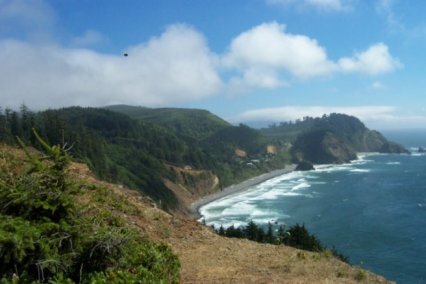 This unknown, area has been secret because of the unusuall amount of activity and the extreme level of importance given to this Area. Alien Dave say's " This area is of great importance, not only to the one's that know of it , but to the one's that control and use it. this is one of many places on Earth that is a Natural Doorway or Portal, for THEM, and is a place that is reserved for the Prepared, the Awake, and the called upon." In any case it is a great photo. 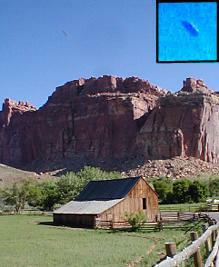 and even if the area is "Unknown" or "Marked" it says that the UFO's are here in Utah. 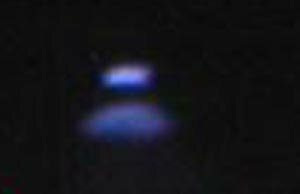 This Luminous Cigar/Cylindrical UFO is one of many of its kind seen in Utah.and by the Utah UFO Hunters. 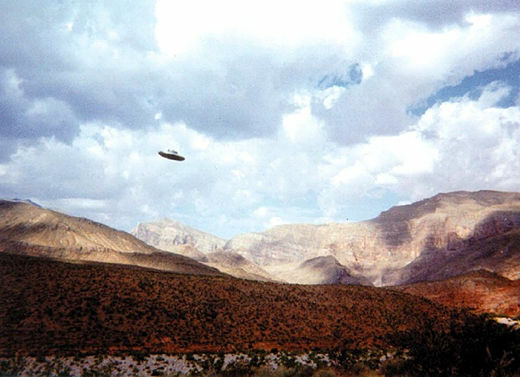 The Uinta Basin UFO Photo taken in the Tabiona area of Utah, November 1999 by Dave Rosenfeld. Hi, a friend of mine brought this to work and showed me. He found it and two others barried under his house when he was doing some work under there house. I have been trying to talk him into taking it to the University to find out what it is. He is afraid he will not get it back. I talked him into letting me take this photo and i told him i would send it(the original of this photo was sent to ArtBell) and maybe he would post on web site and some one might know what it is. Crashed Triangle Spacecraft Half-Buried on the Surface of Mars? This anomaly was originally identified by Efrain Palermo, in the MSSS Archives. The original image processed by MSSS was overly contrast-enhanced and exhibited a strange square processing artifact that originally caught the attention of Efrain. 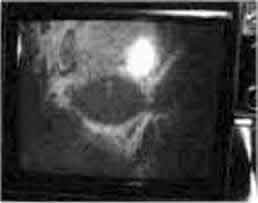 Because the raw image is 3.5 meters / pixel, the object is about 100 meters across, and appears to be roughly heart- or triangle-shaped. Upon close examination, several anomalies are apparent. There appear to be several support structures on the top. The shadows on the lower left suggest that the object is raised above the otherwise relatively uniform surface. This view shows one side and back of the object in more detail. Note the 'string of pearls' and the wake-like pattern in the surface to the lower left which may have been caused by the propulsion system of the craft. The 'hanging beam' appears to cast a shadow on the right side. Note the dark cross-shaped area and circular depressions to the lower left of the cross. This might be a possible design template for the possible craft. This is a 3-d view I made with a from shape-from-shading program I wrote in IDL, of the object showing the blast area. Note the two impressions possibly caused by material ejected from the object during an explosion. 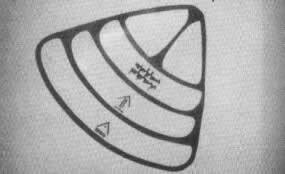 The direction of the possible craft may have been from the upper left to the lower right, suggesting this craft may have been triangle-shaped as it slammed into the ground, created an explosion which destroyed the right side of the craft and created a wide, spreading pattern of blast debris. ...and Technology, Saksit Tridech, told the Bangkok Post. "We are quite sure the fireballs are a natural phenomena," he reportedly said, adding that the team's initial assumption was that the fireballs were caused by methane and nitrogen. Decomposition of accumulated plant and animal remains on the bottom of the Mekong could lead to the release of the gases, which rise to the surface of the water when the sun heats the water to a certain temperature, Saksit said. Legend, however, says the flames come from a mythical Naga, or serpent, living in the Mekong river. "Society needs an explanation for this phenomenon," Saksit was quoted as saying. Claims by a television program last year that the fireballs were actually caused by tracer bullets fired by Laotian soldiers across the border caused uproar among locals, who labelled the suggestion insulting. A young lawyer was enjoying a quiet evening at home when he received a telephone call from a friend in a nearby city. 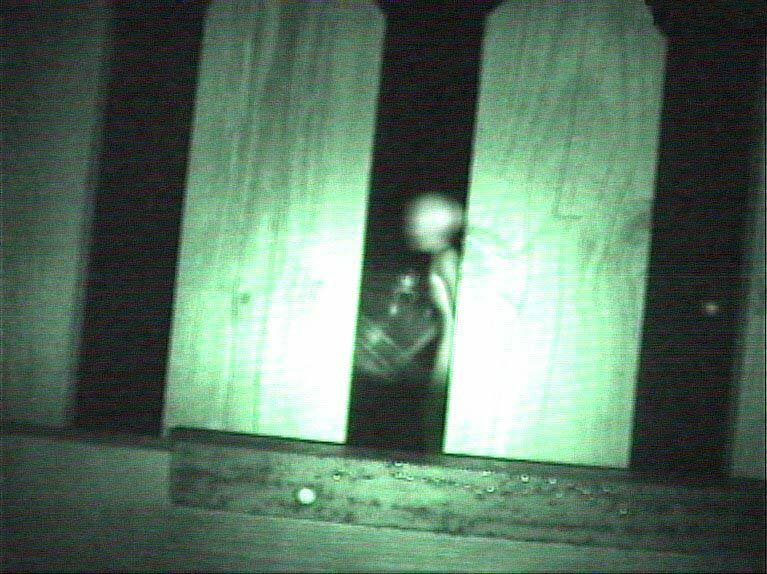 The friend stated that she was watching an unidentified flying object in the sky and it appeared to be in the vicinity of his residence. 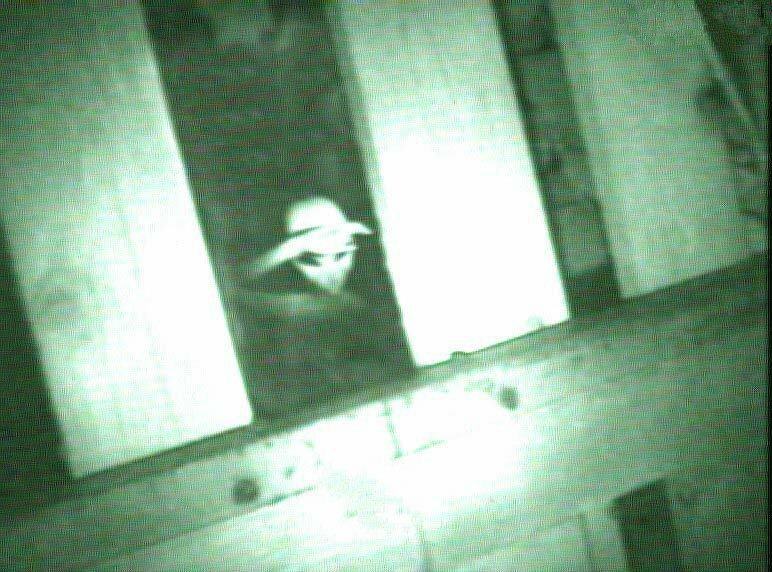 The friend remembered that the young lawyer had a video camera and also was well positioned to view the UFO from his apartment building perch. The year was 1988 and what the lawyer videotaped from his apartment has remained with him to this day. He does not seek fame and in fact wishes to remain anonymous. He has kept the four plus minute tape for the past decade and only recently has decided to share it with the world. The first view is somewhat similar to what has been described as a Roswell type aircraft. It seems to have a delta wing shape. 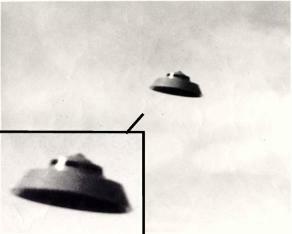 This view appears to show a craft after banking exposing the famous round saucer shape.Then suddenly the shape changes again to illustrate a very alien shape. Either this is the Aurora project or an alien craft. I have black-barred out the kid's eyes. I know enough about computers and retouching etc, to know that this could have been faked if someone really wanted it to be. But having held this photo in my hand and examined this photo plus having worked in print production in NYC I have determined for me that this is no fake.